Hello, hello! Today I have a new card to share with you. I used some cork sheets for the background and made my own pattern paper for the two strips on the sides. The heart bubbles were stamped using the Chit Chat stamp set by Technique Tuesday. I used a light wash of watercolour paint to colour the hearts. I have another card tutorial for you today. 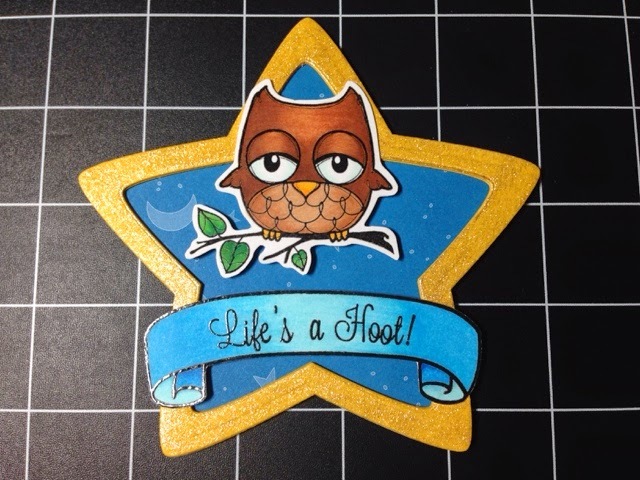 This one is a star shaped card with a cute owl. 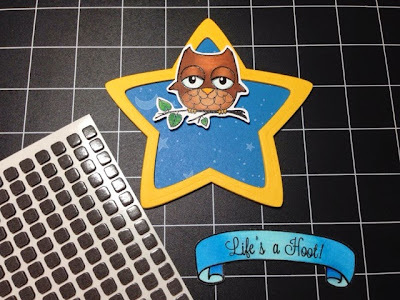 Stamp the owl image on cardstock. I usually heat emboss all of my images before I colour them with Copic markers, but this step is not necessary if you use Tsukineko's Momento ink. With the die cutting machine cut out four outlines of a star using the two largest star dies in the Lawn Fawn Puffy Star Stackalbes die set. These will become the boarder around the card. 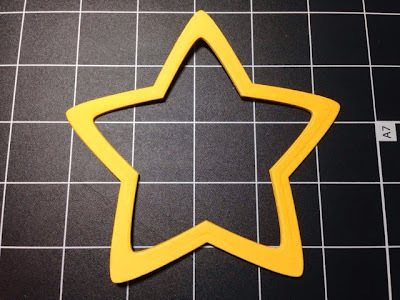 Glue the four star outlines together into a stack to create a chipboard-like boarder. 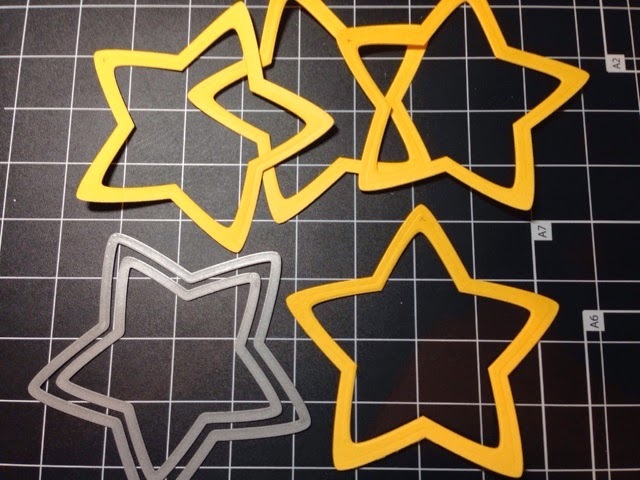 With the die cutting machine cut out two more stars using the largest star die. One out of the night sky pattern paper and one out of heavy-weight cardstock. 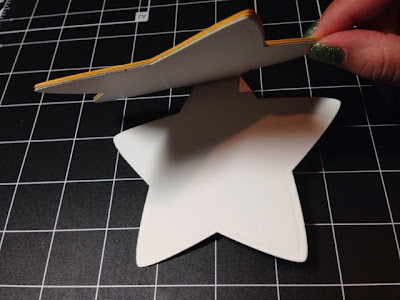 Make a score line (on the heavy weight cardstock) about half way down one of the points of the star. 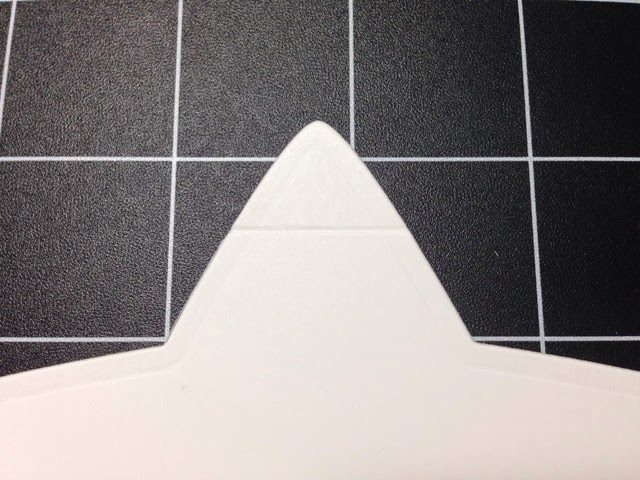 This will allow the card to fold open once it is assembled. Use the strongest double-sided adhesive you can find, I recommend the Sookwang Score Tape. 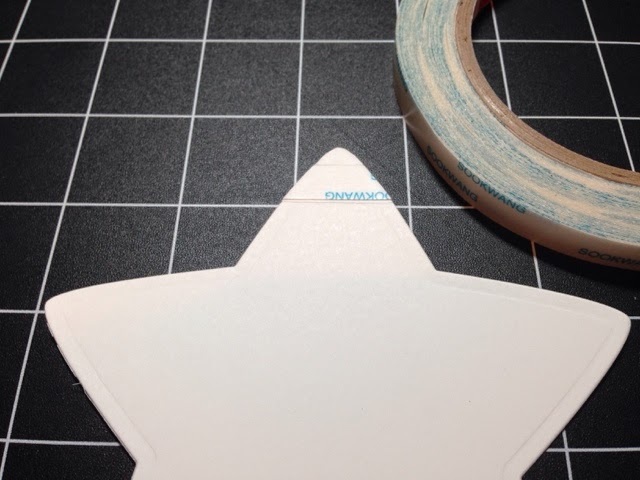 Cover the tip of the star with adhesive down to where the score line is. 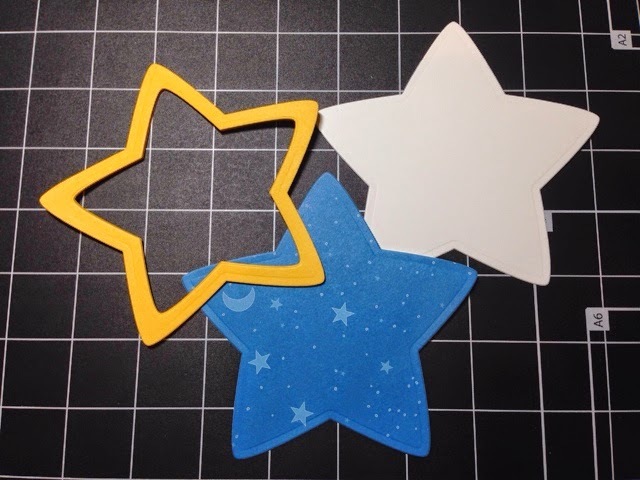 Glue the night sky pattern paper to the back of the star boarder (sorry I forgot to take a picture of that). And then tape the white cardstock to the back of the pattern paper. 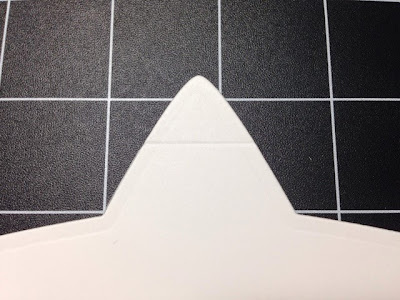 Stamp the banner and sentiment onto white cardstock (heat emboss it if you like). Colour the banner blue and then fussy cut it out. 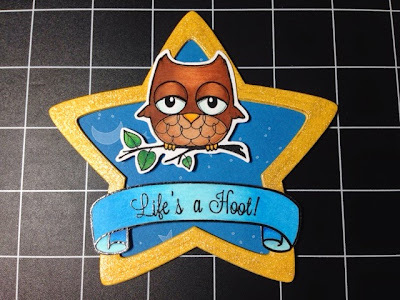 Use foam adhesive to tape the owl and sentiment onto the card. If you choose to make the star boarder sparkly then do step 10 before adhering the owl and sentiment. Add glitter into the star boarder to give it some sparkle. I used the Wink of Stella Bursh because I love the fine glittery effect that it makes. I must admit that freehand painting scares me a bit as I have not drawn or painted in such a long time. But I gave it a try and made this card. I haven't decided what sentiment I want to add to this card, maybe I'll leave it blank. In the corner is my Chinese name. Of course I had to stamp it crooked... *roll my eyes at myself* Maybe next time I should stamp that first before painting on it. 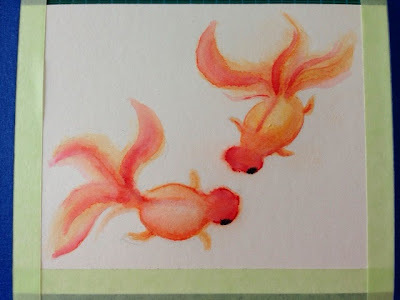 When I first painted this goldfish my hubby commented that this looked like a turtle with a tail. So I fixed it up a bit and he's not a turtle-goldfish anymore. Not as much at least, LOL! 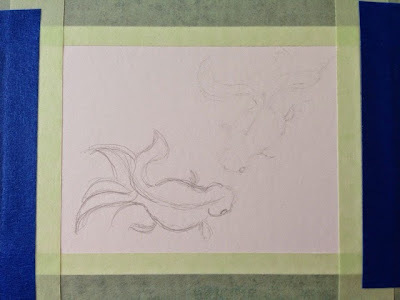 I taped the piece of watercolour paper onto a small (self-healing) cutting mat so I can rotate it while I paint. 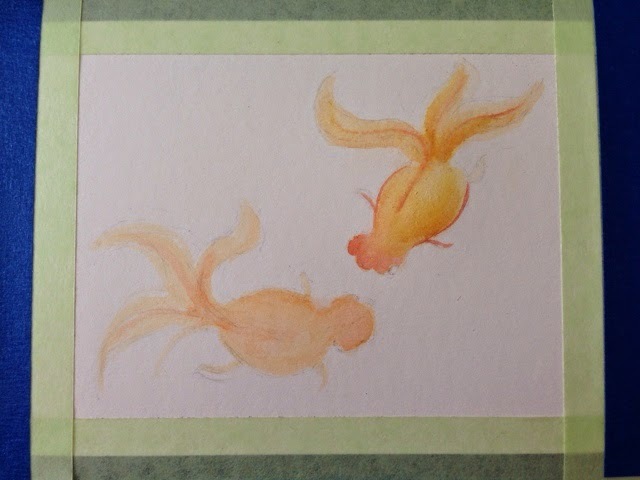 Then I used a pencil to sketch out the goldfish. 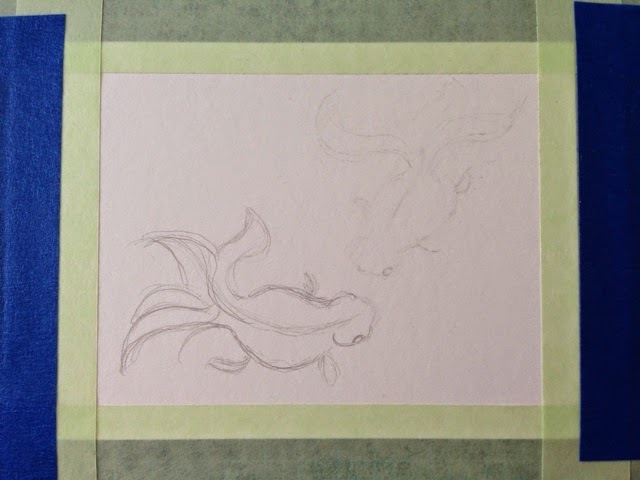 Before I started painting I used my eraser to really lighten up the lines so they won't show through the watercolour paints. Started with a light wash of orange and red colours. Gradually added more layers of colours. I wasn't patient enough and painted their eyes too soon causing the black paint to bleed. Their eyes ended up larger than I had planned. 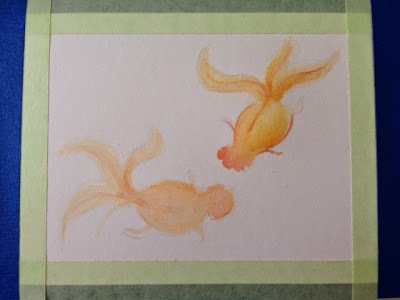 Also, in this picture, you can see how the bottom goldfish looks like a turtle (with a tail, as my hubby put it). HAHAHA! I can't remember which night it was, but I got really tired of watercolour painting and just couldn't come up with any new ideas. I stared and stared at my desk not knowing what to do and then spotted a package of white Prima Mulberry Flowers. I dumped the flowers out, played with them for a bit and decided to watercolour on them. I diluted some Distress Re-inker Ink (in Peacock Feather) with different amounts of water to create different shades of colour. Then I soaked the flowers in the solutions and created these aqua coloured flowers. I layered and glued the flowers in the top and bottom corners. The sentiment came from the Simon Says Stamps - Very Special stamp set. I was lucky and found some enamel dots in matching colours, so I added them as well. I'm very pleased with this card, because it turned out much better than I anticipated. I made this card for day 6 of the class. 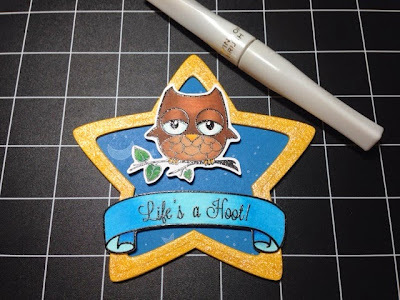 Jennifer McGuire painted her stamped image using Tsukineko Sparkle Sheer Shimmer Spritz Refill. But since I didn't have any, I mixed some Perfect Pearls into a small amount of water and created my own shimmer water to paint with. I tried several times to paint images using the shimmery water, but I just wasn't in the mood that day and all my attempts turned out horribly. Instead of dumping out all of the shimmery paints I made, I used them to make simple backgrounds... a whole lot of backgrounds. I cut the background into two halves to create a space on the card base to stamp my sentiment. The sentiment came from the Simon Says Stamp - Banner Sayings stamp set. You can see the shimmery background better in this picture. 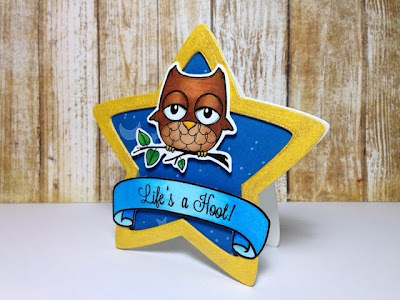 This cutie pie came from The Greeting Farm's Super Secrete Stamp Club - #5 Hood. I painted her using watercolour markers and had lots of fun doing it! First I watercoloured the background using two shades of Distress re-inker inks and dried it with my heat tool. 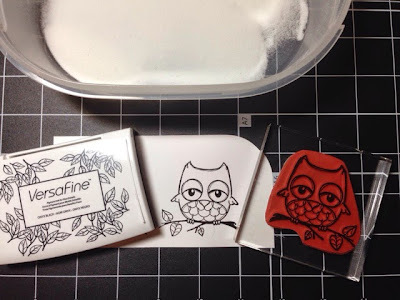 Then I sprayed a background stamp a few times with plain water and then stamped it onto the background. The stamp picked up the paint from the background and left an imprint of the image. I repeated this 4 or 5 more times and resulted in this background. I like how it turned out, so I'll definitely be using this technique again! 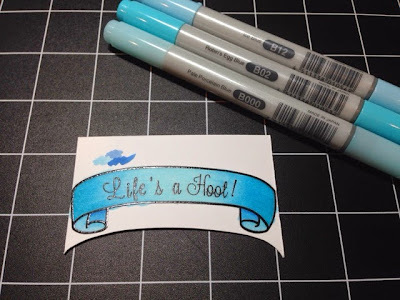 I stamped a sentiment on white cardstock and created my own banner. 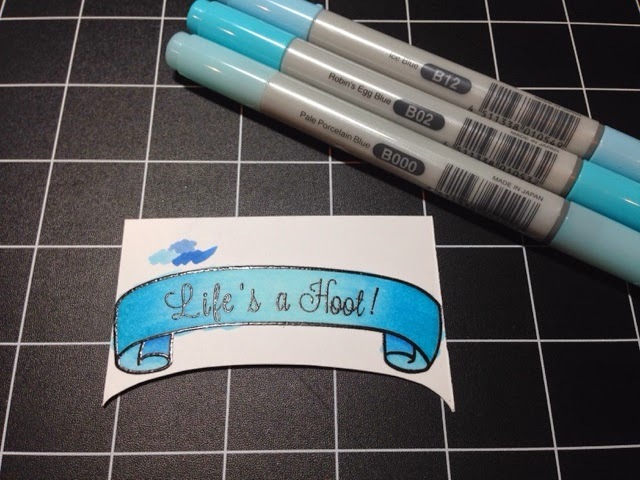 I outlined the banner using the clear Ink of Stella Brush to make it stand out a little more and to match the pink stripes. You can't tell from the pictures, but the pink stripes in the middle panel were painted using perfect pearls mixed in water which created a shimmery effect. This is the inside of the card. Both the sentiments on the outside and inside of the card came from a stamp set called Say What by Mama Elephant. While I was trying really hard to avoid using floral stamps for the majority of the class, I finally gave in on day 8. ALL of the instructors used floral stamps and painted them SO beautifully, I just couldn't resist. Believe it or not, this card took me an entire day to finish! I hand painted all the flowers and it took way longer than expected! I majored in drawing for my undergrad degree so painting is not one of my strong suits. But I tried really hard and I guess it turned out... ok? I kept the card simple. I used a frame die (it's an old one, so please don't ask me the name of it or the company who made it) to emboss a frame onto the card base. Then I cut out a smaller frame to paint my flowers on. I didn't paint the flowers from scratch, they came from a stamp set by Mama Elephant called Lovely Mums. I painted the larger flower on the right first, so it turned out better. The one in the left corner turned out a little darker than I wanted, so I don't like it as much. The sentiment I used also came from Mama Elephant and the stamp set is called Tree Friends.